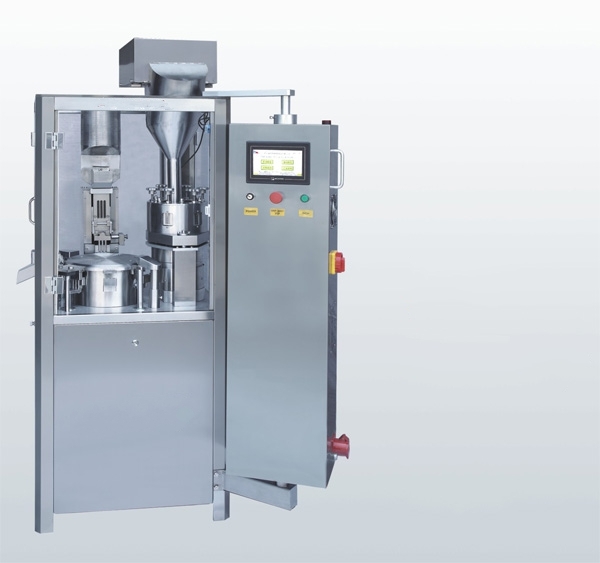 NJP-400 Fully Automatic Capsule Filling Machine is filled by powder, grain,tablet.It adopts multi-bore dosing, intermittent motion and timing frequency conversion. It is suitable for automatically completing capsule feeding, separating, filling, (waste capsule rejecting), closing, finished product ejecting for powder or tiny pill medicine in capsule. It is designed sophisticatedly by our factory according to the practice on domestic, it is fully accord with the GMP standard. Meanwhile, this type machine replaced of the Semi automatic capsule filling machine and won a good reputation with our reliable quality and reasonable price in domestic and aboard. It has been improved the inner design turret, and imports beeline bearings for each machine from Japan directly, so that it can be sure a longer usage-life and precision of machine. The working station cam runs under the good lubricating condition, and maintains the inner lubrication of cam slot to a full extent, increasing the pressure pulverization oil pump, thus extends the operation life of the spare parts. It is controlled by the computer, has a step-less timing with the frequency-conversion, the numeral showing makes an easy operation and clear appearance. The multi-bore dosing brings a precision dosage (it is controlled around ±3.5%); the good capsule applicability makes a higher capsule qualified rate (99%). It has a protector equipment for the operator and the machine. It has a automatic pause equipment when it is lack for the material. It has a steady and safe working, it is the best choice for the hard capsule made factories. Working steady, safe and reliable enough. Capsule qualified rate is ≥99% with the precise dosage. Timing frequency-conversion, programmable controlled. New closed structure, accord to GMP standard. Looking for ideal Fully Automatic Capsule Filling Machine Manufacturer & supplier ? We have a wide selection at great prices to help you get creative. All the Capsule Filling Machines are quality guaranteed. We are China Origin Factory of Capsule Filling Equipment. If you have any question, please feel free to contact us.